Will the US Air Force’s Top-Secret Bomber Cost $3 Billion Per Plane? Uncertainty continues to linger over the real costs of the Pentagon’s new bomber. 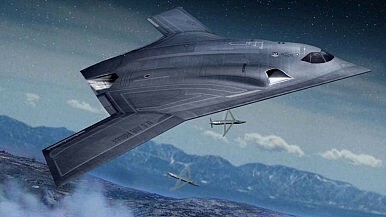 As I reported four days ago, the costs of the top-secret Long-Range Strike Bomber (LRS-B)–likely to be designated B-3–have gone up due to a calculation error, according to the U.S. Air Force (See: “US Air Force’s Top-Secret Bomber More Expensive Than Thought”). In 2014, the Department of Defense’s ten-year budget estimate for fiscal years 2015-2025 for the bomber program was $33.1 billion. This year’s estimate for fiscal years 2016-2026 jumped up to $58.4 billion. The U.S. Air Force, however, stated that both numbers are wrong and that the actual ten-year costs (the first installment in the 30-year program) are $41.7 billion for each period. “The 10-year cost estimate provided by the Air Force for LRS-B in Table 4 of the FY2015 and FY2016 Section 1043 Report was incorrect. The correct 10-year cost entry for both the FY2015 and FY2016 reports is $41.7B. Again, the program costs have remained stable,” Air Force spokesman An Stefanek told Breaking Defense. “This sudden 76 percent increase in estimated cost is alarming, because it raises questions about the management of a crucial program that lacks transparency, on which we cannot afford serious cost overruns, development errors, and reduced production numbers that would deprive the United States of one of its core military capabilities,” Speier emphasized. “LRS-B is considered a special access program and thus does not report detailed program information in unclassified budget justification documents,” a report by the Center for Budgetary and Strategic Assessments (CBSA) notes. The U.S. Air Force is expected to buy 80 to 100 bombers. Northrup Grumman is competing against a combined Boeing/Lockheed Martin team to be the primary contractor for the LRS-B. The contract is likely to be awarded in September. However, the often cited number of $550 million per bomber is based on 2010 dollars and the purchase of all 100 planes. Since very few defense analysts expect the U.S. Air Force to buy all 100 aircraft, the per unit cost is very likely to increase. In fact, one analyst called 100 new bombers a “wild fantasy” and expects per unit costs to rise to $3 billion. With 100 purchased planes, CBSA estimates that total costs will be around $90 billion in 2010 dollars, or approximately $73 billion in Fiscal Year 2015 dollars. Boeing's protest over the Air Force’s decision to award a competitor the contract for a new bomber was struck down. Pentagon Awards Contract for US Air Force’s New Top-Secret Bomber US Air Force’s New Top-Secret Bomber Faces Further DelaysUS Air Force’s Top-Secret Bomber More Expensive Than ThoughtAdios, Top Gun: The End of the Fighter Jet? What Do We Know About the US Air Force’s New Bomber?